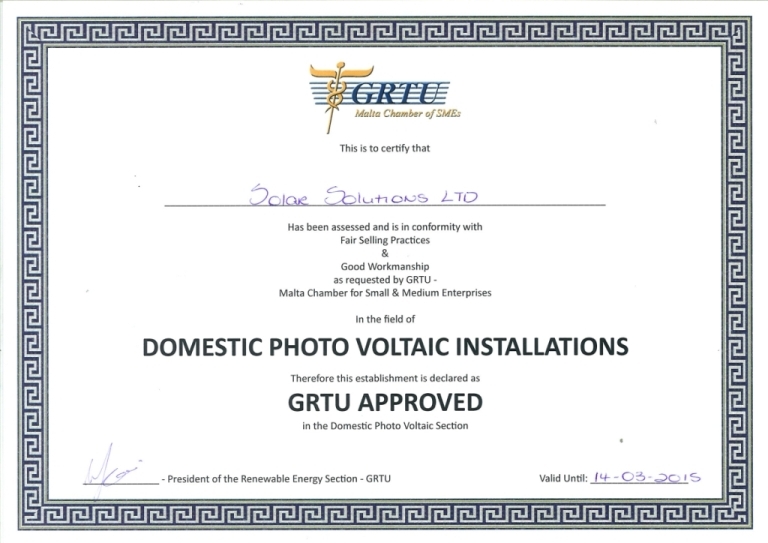 Solar Solutions Ltd is awarded certification from GRTU | Solar Solutions Ltd. Solar Solutions Ltd have just been approved by the GRTU – Malta Chamber of SMEs – as being in conformity with fair selling practices and good workmanship for the sale and installation of photovoltaic panels in the Maltese Islands.This will automatically allow customers to benefit from a green loan from Bank of Valletta at no extra charges or interest fees due to an agreement between BOV and GRTU.This arrangement is applicable to only those PV installers who have been awarded these certificates. Solar Solutions is one of only 5 companies in Malta to be certified and this reflects the commitment by Solar Solutions Ltd towards quality in all its processes for the benefit of customers. This certification follows that of ISO9001, ISO14001 and certification for installers of PV (single phase and three phase) and solar water heaters by the University of Malta. © 2018 Solar Solutions Ltd. All Rights Reserved.